Police violence in the United States should not surprise anyone. In Ferguson, Missouri, we have witnessed the use against US citizens of Iraq-tested war technologies. 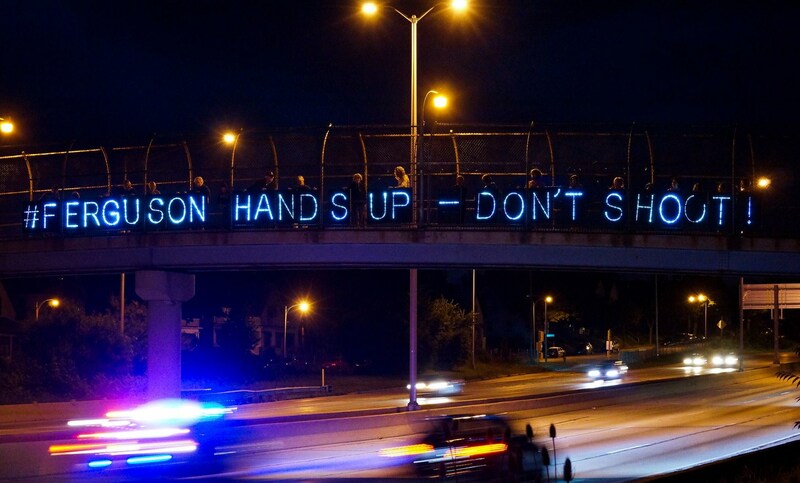 On August 17, 2014, a police force using armored vehicles and military tactics fired rubber bullets and tear gas canisters at peaceful protesters who had been demanding justice against Darren Wilson, a killer cop who took the life of Michael Brown, an unarmed black teenager. Wilson discharged 12 shots. According to an autopsy, Michael Brown was shot six times: four times in the right arm and twice in the head. One of the head shots blasted his right eye, rattled through his head, then came out through his jaw to penetrate his collar bone; another penetrated his head from above, which could indicate an “execution style” for the killing attributed to Wilson. A return to violent tactics rather than the community policing promised by the authorities to the people of Ferguson, and a decision by Governor Jay Nixon to call up the National Guard were very much part of an escalation. For decades and all over the world, the US has worked to spread “freedom and democracy” via warfare. As long as this was being done in the towns of Vietnam, Afghanistan or Iraq, ordinary Americans often applauded the endeavor, lured by the disinformation, but mostly they ignored the crimes being committed in their names, because these were not in their own backyard. As the streets of Ferguson look more and more like those of Fallujah, it is impossible to dismiss that the US’ best exports, warfare and civilian repression, have come home to roost. When the war machine runs out of places to occupy abroad, it mutates into an occupying force at home, starting in Black or Latino neighborhoods, and it manifests itself as police violence, curfews and a state of emergency. This is what happens when the military-industrial complex becomes the cornerstone of an economy. The US economy is a war economy. Together with fostering warfare aboard, a climate of insecurity at home has become a necessary business model for the growth of the war and security business. Between 2001 and 2014, US military spending more than doubled to exceed the staggering level of $700 billion dollars a year. This represents about 20 percent of the overall federal budget despite not including retirement and medical care for veterans, which represent an additional 3.5 percent of the budget. Furthermore, this 23.5 percent of the budget per year does not include emergency and supplemental bills for the specific wars in Afghanistan and Iraq, nor does it include moneys for the vast domestic “security” apparatus that comprises the Department of Homeland Security, FBI counter-terrorism or NSA intelligence gathering. To give a sense of the gargantuan size represented by a more than $700 billion expenditure on defense per year, consider the fact that the US spends more on its military per year than on benefits for federal retirees, transportation infrastructure, education, and scientific research combined. Or if you prefer, consider the fact that the US spends more on its military budget per year than the military expenditures of China, Russia, the United Kingdom, France, Japan, India, Saudi Arabia, Germany, Italy, South Korea, Australia and Canada combined. Police and military have become almost impossible to tell apart due to two little-known Federal programs: the Department of Defense Excess Property Program (DOD 1033) and the 1122 Federal Program. The DOD 1033 Program lets the DOD provide surplus equipment to state and local police under the pretext of “counter-narcotic, counter-terrorism operations and to enhance public safety.” The 1122 expansion was voted in 2009 under the Duncan Hunter National Authorization Act. According to the US General Service Administration, the 1122 Program “offers Americans peace of minds.” The 1122 Program enabled state and local police to become militarized by getting gear from the Pentagon, which is allowed to give local US forces billions of dollars worth of sophisticated weapons of war, including high-caliber automatic weapons, armored vehicles, armed drones, and stun grenades. The 1122 Catalog for “all your local war needs” is extensive. The state of Missouri benefits from both the DOD 1033 and the 1122 Federal Programs. Police officers are supposed to enforce the public safety against crimes. Community policing should never include high levels of militarization, systematic intimidation and denial of constitutional rights. Police officers were never supposed to be used to crack down on dissent and protest. Some people still call them “peace officers,” although this is a role they no longer fulfill. 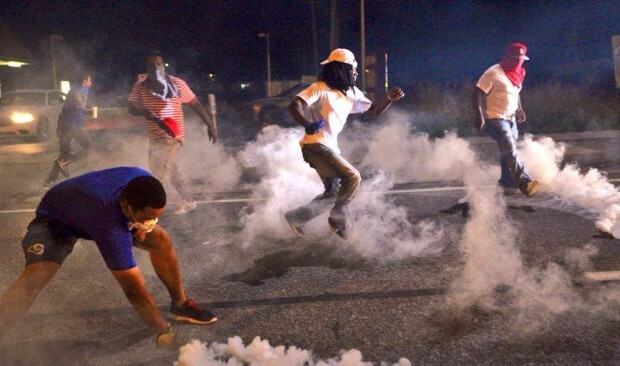 It is not surprising that protests and riots have erupted in Ferguson. What is surprising is that they have not occurred simultaneously in more towns on a much larger scale. Many times in the past few years, unacceptable police brutality went largely unchallenged. In Florida, for example, an unarmed 22-year-old Haitian called Raymond Herisse was riddled with 116 bullets by killer cops in Spring 2011. This followed the killings of six other youths in Florida by police in 10 months, without so much as an investigation. In New York, the death of Jamaican 18-year-old Ramarley Graham at the hands of a policeman in Summer 2012 was one of three police killings of black youths in one week. 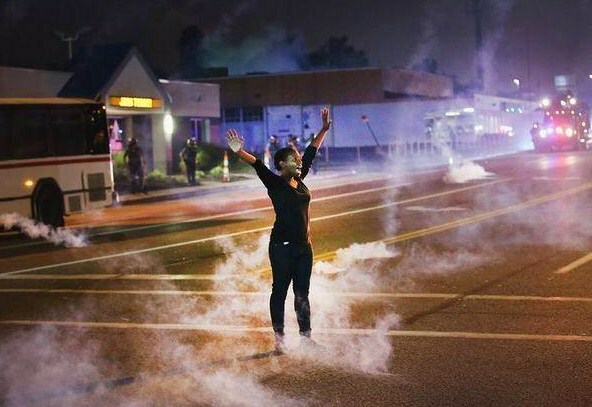 The reaction in Ferguson was the first time since the Rodney King riots in Los Angeles in 1992 when people, driven by a need for justice, took their anger to the streets. Popular anger is justified when the clear and present danger to freedom is the introduction of a militarized force into our vanishing democracies. Editor’s Notes: For more from Gilbert Mercier on the war culture in the United States, read The Orwellian Empire, available as a paperback from Amazon. “Best writing on the Web”. Thank you, Gilbert, for your excellent diagnosis & writing, as always. I accidentally had to listen to MSNBC today. 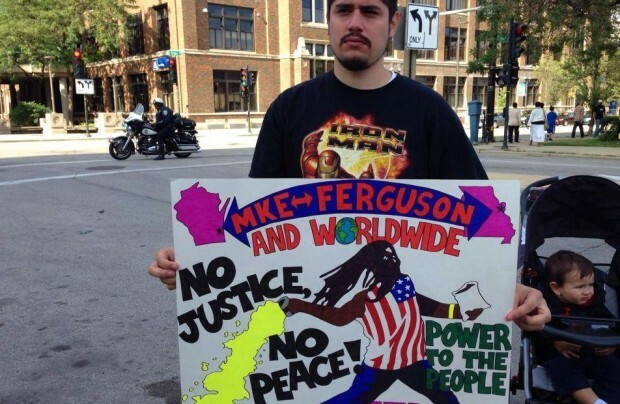 It spent a lot of time on so-called “outside agitators” in Ferguson. Exactly the precise terms the authorities and media used against the civil rights and anti-war movements in the 1960s. 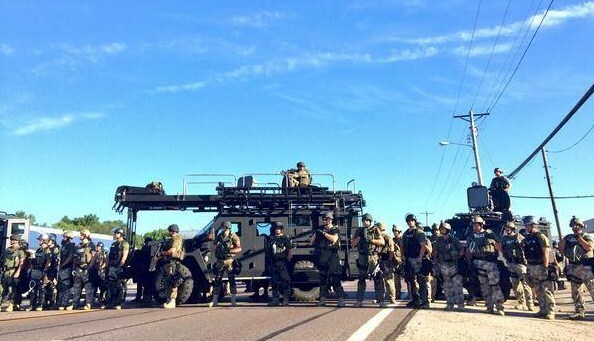 This time, it is under military occupation in Ferguson, MO. MSNBC, home of sellout Al Sharpton, did not mention the fact that the term “outside agitator” was inflicted repeatedly on Dr. Martin Luther King, Jr. as was “Communist” and other Stalinist/fascist racist white supremacist epithets. You know what I mean. It is under the breath of the white cops and their replacements in the white National Guard in Ferguson. They call us terrorists so they can terrorize us. Good analysis, as usual, Gilbert. Thanks. I couldn’t believe my eyes last night when I saw a police officer acting crazy with a high powered rifle that he was pointing at everyone. He threatened to kill the journalists who were only recording the scene. 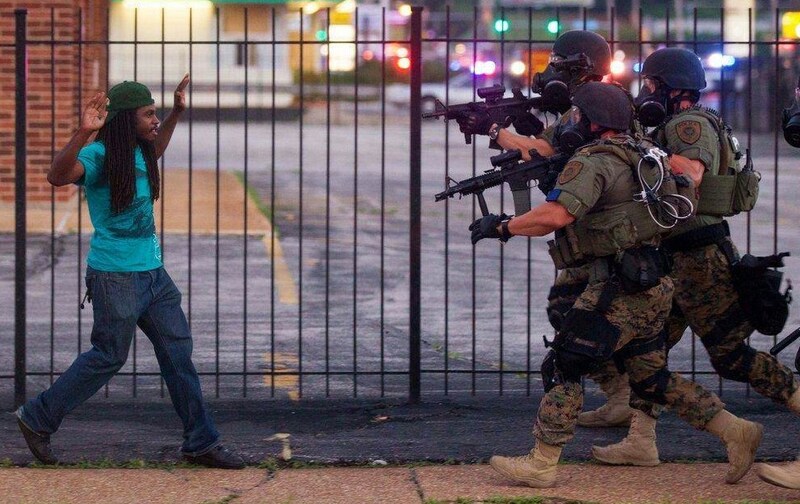 If this cop is the example of the police in Ferguson, then Ferguson is the first place where the attorney general should take back all that equipment and not let them have it back. 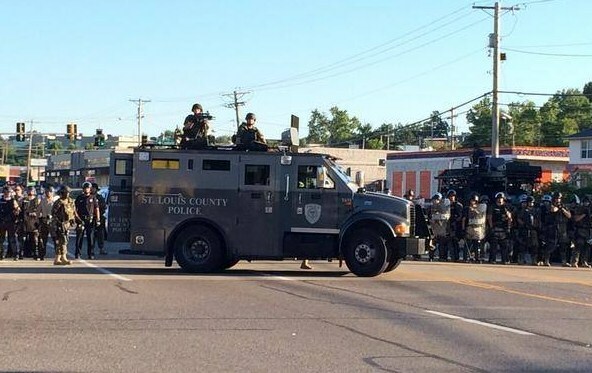 It’s easy to connect the dots and see the correlation between militarization of our police and the fringe elements of our country arming themselves to the teeth in expectation of a revolution.